This is a Chaenomeles speciosa, commonly known as flowering or Chinese quince, sometimes also as Japanese quince (but not to be confused with the smaller shrub C. japonica, also known as Maule's quince). It is edible, but very sour (lots of vitamin C! ), very hard and often slightly bitter. Culinary uses are similar to regular quinces (Cydonia oblonga), but due to the high pectin content they are especially suited alone or mixed with low-pectin fruit for jams and jellies. The plant itself is - at least in the western world - typically planted for the showy flowers as ornamental hedge (C. japonica is smaller and often planted as solitaire), not primarily for fruit. In fact, many gardeners don't realize that chaenomeles are edible. 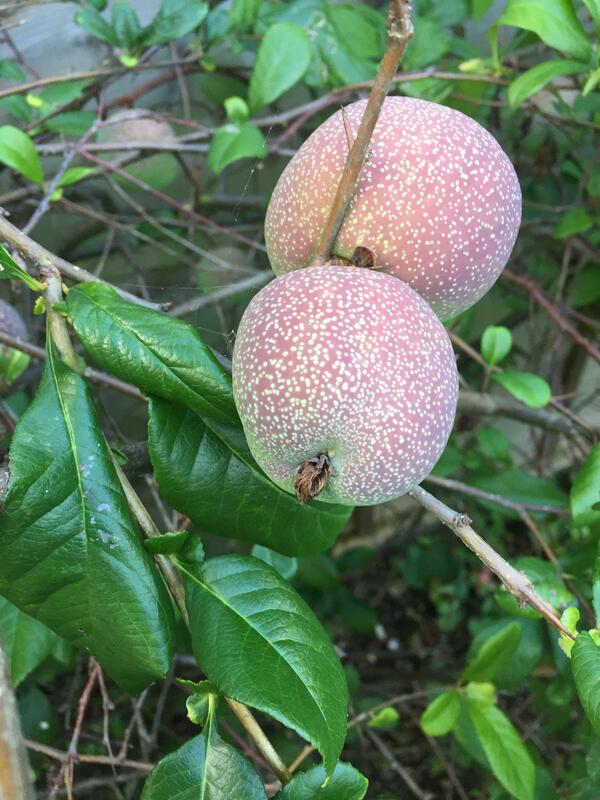 The fruit in your picture are far from ripe, they need at least another two months and will turn yellow and fragrant with dark kernels. They remain hard and if picked before the first frost and can be stored for months. Harvesting after the first frost gives you slightly softer fruit with shorter shelf life, but even better aroma as some of the bitter components are destroyed. Looks like a quince to me. Very astringent. Basically inedible raw but used in jellies with a ton of sugar. I would call it more candied that jelly myself, at least any I have ever had. In truth, in US I have seen it grown far more as an edible than a culinary item, but have always understood it is more popular some other parts of the world. Russian ladies I worked with were especially fond of them. I believe there are some other culinary uses, but would think most involve pickling or sugar type curing to break the astringency. I would regularly add a few too my cider pressings though when I had too many apples that were too sweet. A small amount added to overly sweet cider registered, at least to me, as tart and mellowed the cider nicely. 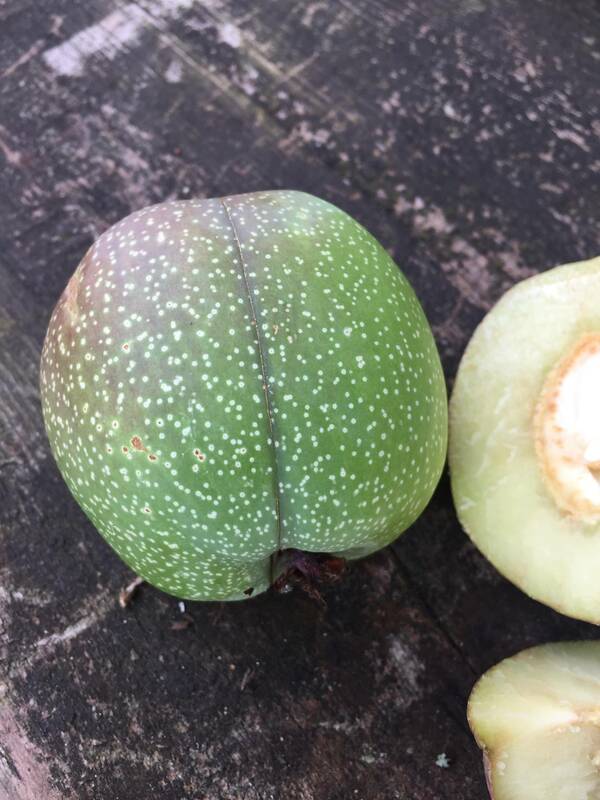 ETA: Sorry, all pictures I am finding of quince look more like deformed pears, less list apple, but the varieties I had and that I grew up with looked like what you or picturing. A very dense apple look with speckles. But the pictures draw into question that ID, so may want to go to gardening for and ID. 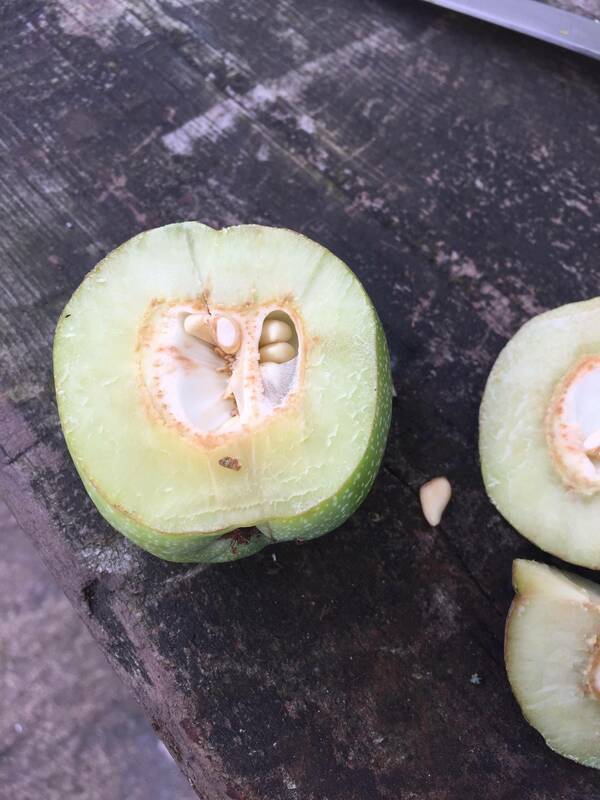 The seed shape is very characteristic of quince though as said before this is chaenomeles speciosa which is used more for decoration, pretty flowers. Decent fruit though looks like you may have picked early, I think the seeds will get darker as it ripens, the fruit turns yellowish. Usually Fall. The fruit ought to twist off easily. But...they can be stored for a long time and will ripen slowly off the plant (with less flavor). When you cook them (boil with water and sugar) they will turn pink. My favorite is quince-cranberry chutney for Thanksgiving.